There's something interesting about turning another year older, isn't there? Yesterday I turned 31. The day was full of all of the wonderfully normal things like feeding the dog, taking a walk, working on freelance projects and catching up on email. Yet it was also full of fabulous little moments: making our bed that now features the most stunning quilt from my step-mom, fielding sweet phone calls from friends and family, hearing my nephew sing the cutest rendition of happy birthday on my voicemail, savoring a bowl of the borscht made in a pre-birthday cooking session with my mom over the weekend, walking to the mailbox to find loads of handwritten cards and chatting with my husband over wine and delicious food at our favorite Italian restaurant. Those little moments made the day and I'm so grateful for all of it. It's obviously not original. In fact, there's a really fantastic song out right now that inspired my thought process. I've been pretty brave in the past and I'm so humbled by those around me doing brave things like building incredible businesses, moving across the country (and the world!) to pursue dreams and career opportunities, participating wholeheartedly in the community, standing up for beliefs and dealing with painful, difficult events. Like everyone else, I'm often afraid in life. I'm scared to fail, speak up, hurt someone's feelings, fall down, get hurt... die. You know? The big stuff. Fear is a completely normal human emotion, but I want to continue working to be brave in the face of all the scary stuff. I don't want fear to drive my big or small decisions in life. So there it is. I want to be brave. Well, it's officially birthday month here on People + Places + Things. This blog will turn two mid-month and I'll turn (gulp) 31 at month's end. Yes friends, I'll be in my thirties. I'm okay with it. In fact, I'm really enjoying my thirties so far. My years as a twenty-something were fun, but I was so unsure of myself and went through some pretty heavy life events -- both good and bad. I was content saying goodbye to that decade last year and this year, I find myself ready to jump into the next 30 years with both feet. 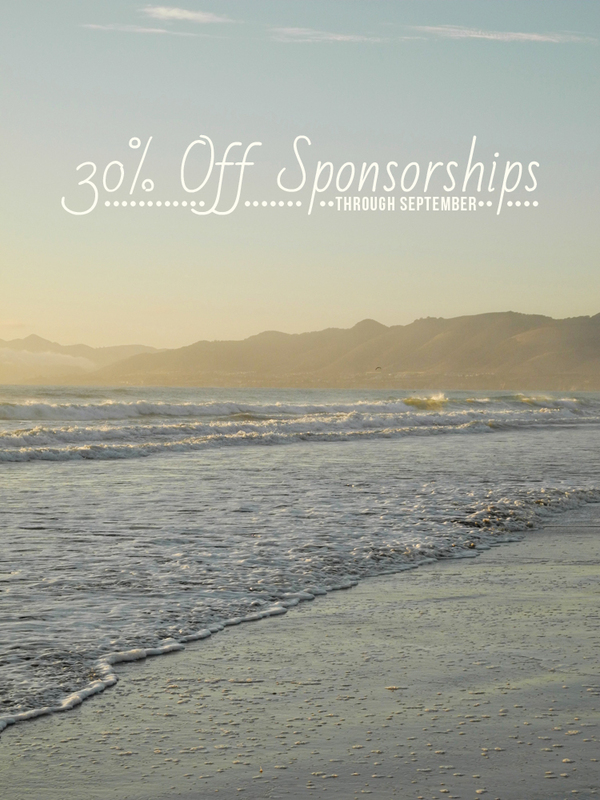 To celebrate, I'll be offering 30% off all sponsorships through the end of the month. If you're a small business owner, online shopkeeper, well-known brand or fellow blogger, I would absolutely love to help support what you do. You can learn more about the sponsorship rates, collaboration opportunities and readership information here . Just be sure to use the promo code BIRTHDAYMONTH at check out to secure the discount. I may have a few more fun goodies to throw out there in the coming weeks, so stay tuned!